The Prime minister Narendra Modi Initiative for Cash less transaction is now bearing fruit in Rural India with help of NGOs and Social workers. A recent example of the same can be seen in the villages of Changlang district of Arunachal Pradesh where R.K. Mossang Memorial Society had organised its week long Awareness campaign on cashless Transaction. RKMMS had organised Awareness campaign in Shantipur and Kamakhyapur village in Diyun circle, Phinbiro and Manmao circle, 17th Mile plywood industrial premises, Jairmpur township, Chamro village, N.Khamdu village, 16th Mile of Jairampur township. Villagers were get knowledge the about SBI Buddy app in details, through live demonstration the procedure displayed how to register in the app and use the aap to pay online bill and recharge send money to one another. Mr Manish Gogoi, NGO Worker, had explained them through live demonstration how one can easily add money in E-wallet, transfer money with one to another, pay bill for mobile or recharge DTH service or booking railway tickets. 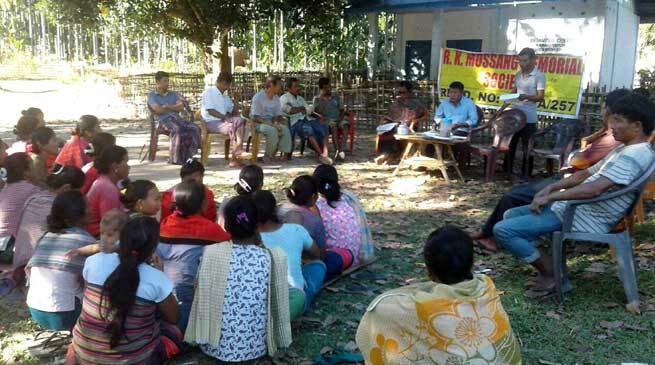 People are very happy after learning the cashless payment system they had appreciated the work done by the R.K. Mossang Memorial society for creating awareness amongst the villagers, industrial workers and residents of Jairampur town. Core persons in the training were tech savvy young people of villages, Manager of Jairampur Saw and Veneer Mill, Crèche Workers and all the android mobile users are mostly takes active part is awareness camp. The villages and area are well connected with electricity and internet facility these villages have no problem of powers and internet. After awareness on cashless payment, it is not necessary to go to bank to withdraw money by standing in long queue whole day in front of the bank.